The Second Star to the Right was originally supposed to be used in Alice in Wonderland. Love this movie! I first saw this film on April 28th 1963-yes I still remember the actual date! It was a wonderful experiance, I've loved this movie ever since. The charm, the colour, the music, the flight across London, the characters! From that day onwards I became a Disney fanatic, drawing cartoons and collecting Disney merchandise. My second favourite film of all time!! 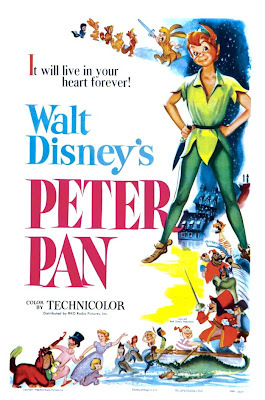 In Barrie's play, it is referred to as Never Never Land, but in his book Peter Pan, it is referred to as Neverland. So, Disney did not come up with it themselves. Otherwise, great review. I love Peter Pan, too. It's the perfect movie to watch before going to bed. :) I'm looking forward to seeing your reviews of other films. Peter pan reminds me of my 13th birthday party. I was dressed as peter pan and we all watched the movie that day. In the evening, I wanted my friends to stay over and so we can watch shows by Andy Yeatman too. It was one birthday that I am not going to forget ever in my life.